Redskins agreed to guarantee Portis' 2008-2009 and a large portion of his 2010 base salaries in March. This will equal up to $15 million in guarantees. Portis, also got a $9.32 million "signing bonus" upon restructuring. In March 2007, Portis weighed in on the recent legal problems Michael Vick started to embroil himself in, the upcoming charges would include dogfighting, which is a felony. Portis took a controversial view of the situation stating, "I don't know if he was fighting dogs or not, but it's his property, it's his dog," Washington Redskins running back Clinton Portis told WAVY-TV in Virginia. "If that's what he wants to do, do it. I think people should mind their business." He further went on to state in the same interview that "I know a lot of back roads that have the dog fighting if you want to go see it." Later that same Monday, he released a statement through the Redskins' website quickly backtracking on his previous statements, "In the recent interview I gave concerning dog fighting, I want to make it clear I do not take part in dog fighting or condone dog fighting in any manner." In 2008, Portis fell just short of what would have been his fourth 1500 yard rushing season in seven years, finishing with 1487 yards and an average of 4.3 yards per carry. His season was highlighted by a five week stretch in which Portis gained nearly 700 yards, ending in an October 26 victory over the Detroit Lions. During this span Clinton Portis joined O.J. Simpson as the only players in NFL history to rush for at least 120 yards in five consecutive games twice in a career (Portis first did it over two seasons with four games with Denver in 2003 and one game with Washington in 2004). 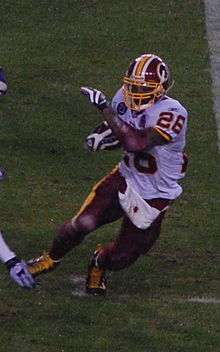 Portis led the NFL in rushing as late as November 23 before nagging injuries and limited playing time slowed him down; he gained only 281 yards in his final five games as the Redskins lost four of five to miss the playoffs. Despite this, he was selected to the Pro Bowl over DeAngelo Williams, despite Williams having better stats at the end of the season. On August 21, 2012, Portis announced his retirement. He was 77 yards short of the 10,000 yards rushing mark, making him 27th all-time rusher he ranked in top 20 running back of all time. He officially retired on August 23 and during the press conference it was announced that he made it into the list of the 80 Greatest Redskins of All-Time. After retirement, Portis admitted to have suffered 10 concussions. In 2013, Portis joined former players such as Daunte Culpepper, Cadillac Williams and Art Monk in a civil lawsuit against NFL over concussion and head injuries. Portis is represented by R. Totka of Athlete Promotions. Portis is the cousin of current Winnipeg Blue Bombers quarterback Josh Portis. Portis filed for bankruptcy protection in December 2015. ↑ *Clinton Portis, RB, Miami - 2002 NFL Draft Scout Profile, Powered by The SportsXchange Archived June 9, 2007, at the Wayback Machine. ↑ "NFL Recap". ESPN. 2006-08-13. ↑ Bryant, Howard (2006-11-13). "Portis Breaks Bone in Right Hand". Washington Post. Retrieved April 30, 2010. ↑ "Portis' contract restructuring". Blog.washingtonpost.com. Retrieved 2012-10-30. ↑ "Redskins RB Portis: Vick can do what he wants - NFL - ESPN". Sports.espn.go.com. 2007-05-22. Retrieved 2012-10-30. ↑ "Clinton Portis frustation". NFL.com. Retrieved 2008-12-11. ↑ "Portis: No rift with Zorn". Washington Times. 2009-06-22. Retrieved 2012-10-30. ↑ Ryan Wilson %BloggerTitle% (2008-11-13). 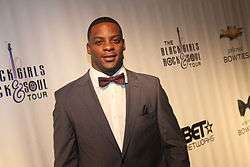 "After LaVar Arrington Calls Out Joe Gibbs, Clinton Portis Sticks Up for Former Coach". Nfl.fanhouse.com. Retrieved 2012-10-30. ↑ Jones, Mike (March 1, 2011). "Redskins release Clinton Portis after seven memorable seasons in Washington". The Washington Post. ↑ Archived February 23, 2014, at the Wayback Machine. ↑ Yanda, Steve (August 23, 2012). "Clinton Portis retires from Redskins and pro football with tears and memories". WashingtonPost.com. Retrieved 2012-08-23. ↑ "Former NFL star who made $40m declares bankruptcy with almost $5million of debt". DailyMail.com. December 18, 2015. Retrieved December 19, 2015. ↑ "Bankruptcy Filings: Clinton Portis Owes Nearly $5 Million". Deadspin.com. December 18, 2015. Retrieved December 19, 2015. Clinton Portis's Official Web Site. Washington Post Local Edition .